The 2010 SXSW Music Conference starts today and unfortunately Live Fix won’t be checking out the action in-person as I’ll be in Chicago this week. But whether you’re there in Austin or not, I wanted to pass along a guide to checking out all the live music mayhem. 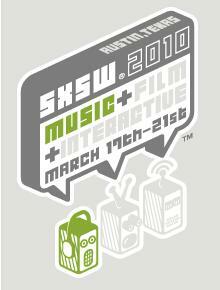 This SXSW 2010 guide will offer up a quick list of Chicago artists and blog-hosted parties featuring some favorite bands we’ve featured on Live Fix that should be making their rise during the conference. I’ll also be keeping an eye out for any daring experiments that pay tribute to the Flaming Lips Parking Lot Experiment. For those of us not going to Austin, I’ve also included a quick list of spots to watch online from the comfort of your comfy couch or via your laptop. The SXSW Interactive conference was last week, and judging by the video below, Austin has already started to boil over and the music conference is just starting. Lastly, we’ll also check in with a local Chicago musician who’ll be playing in several shows and he’ll give us an update later in the week. So stay tuned for his report. We featured Fool’s Gold on Live Fix in November as part of my Popmatters interview that took place before the band’s Chicago show last fall. And I’m hoping that Fool’s Gold causes a stir with their exotic brand of western rock and afro-pop. These guys are good and tons of fun live. Brooklyn Vegan and Spin Magazine both have a good list of bands to see including one of my favorites Chicago rapper/emcee Rhymefest who will drop his long-awaited El Che album in May. I gotta represent the Chi so here’s a list of Chicago bands from Gapers Block and Chicagoist that will be playing SXSW this year. Popmatters will be hosting the AM/PM party featuring Tom Schraeder and other artists. We’ll be checking in with local musician and drummer Shawn Rios during the festival to see things from the artist side of the stage. I’m not kidding when I say that he’ll be a very busy man. Just take a look at the list of bands and shows that he posted on his Facebook page. Shawn’s one of the best drummers in Chicago and I’ve seen him play many times. He’s given me countless insights in to the live music experience and regardless of his insane SXSW schedule, I’m sure he’ll make time for us and give us a quick update on the vibe of SXSW 2010 and what it’s like from an artist’s perspective. I’ll be checking out IFC’s and WOXY.com live broadcasts and video updates. And I’ll be keeping a curious eye on Live Daily’s updates from Stubb’s mainly because they’re sponsored by Ticketmaster and I’m interested to see how the recent Live Nation Ticketmaster merger will impact this year’s festival from the stage. I’m also looking forward to see what we can learn from the industry panels on paperless promotion and other topics. We Don’t Need No Stinkin’ Band! This last thing caused many of the attendees of the SXSW Interactive festival to tweet the feat last week. But I thought it was sort of a strange thing because it was missing two very important elements to crowd surfing: the band and the music. But as you can in the video below that didn’t stop Leo Laporte from “breaking the world record for longest live-streamed crowd surf” during the Diggnation panel. If that happened without the music, I can’t wait to see what happens when the music starts playing today.